When clicking right on the selection tree, you can choose a filename to save the current selection. 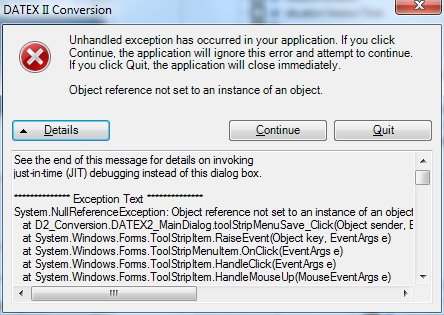 Immediatly after that, the program gives an unhandled exception (see attached image). It's possible to continue without loosing data, but no saving is done. I cannot reproduse this problem, tried it both on Windows XP and Windows 7. Is it a certain model that crashes the tool? Or is it certain user steps taken? However, the error handling around Save selection and Load can definitly be improved If you press exit in the save dialog you also crashes the tool. Added enhanced error handling both to Save and Load. That has seamed to solve the problem.